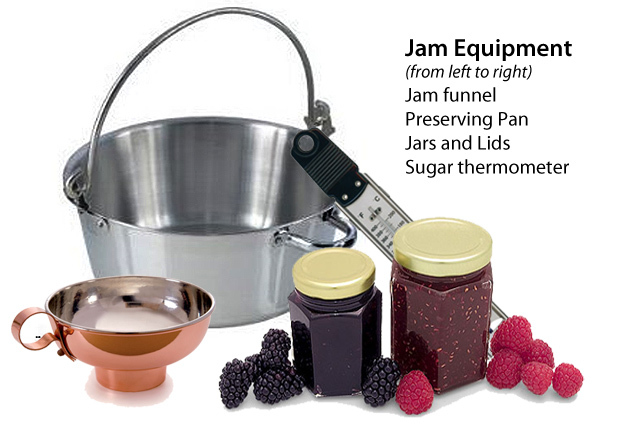 the Big World Blog: What Equipment Do I Need to Make Jam? What Equipment Do I Need to Make Jam? Click to see on Amazon and Save!! Although there is no need to buy any special equipment to start making jams and pickles getting some jam making equipment will certainly make the job easier. But if you just want to make a jar or two to try your jam making skills out you could use the tools you probably already have in your kitchen. The list below will vary according to your needs but they will all help you if you decide to make more jam or jams in any quantity. I would definitely recommend a preserving pan, it’s the one item that you really ought to consider buying. A heavy gauge aluminium preserving pan should last a lifetime. It will be larger than your family sauce pans and a lot wider. You can make your jam in one go in these pans, without having to clean up spilt, very hot and sticky jam from every surface that your jam making has gone near. (When making Jams and especially pickles do not put a lid over the pan as the jam will not reduce, preserving pans with their wide tops aide the reducing process). You can buy these quite cheaply or re use commercial jam pots you have used before. The jars have to be clean as this prolongs the life of the preserve. The best way to do this is to wash the jars and lids in hot water and detergent (washing up liquid). Then place the jars upside down in the oven at 100 to 120 degrees centigrade. Bring them out when the jam is ready to jar. Many lids now have plastic inners to help keep them airtight so don't put this type in the oven. Make some greaseproof paper circles slightly larger that the lids and place them between the jar and the lid when bottling. This will provide a clean and airtight seal until your ready to eat the jam. A jam funnel has a small spout and a wide funnel that sits well in your cleaned jam jar and makes pouring the jam into the jars less wasteful and less messy. At a push you can use the top third of a plastic bottle but watch it doesn’t melt when pouring hot jam through it. Personally I don’t use these because they steam up in the pan and are hard to read. However they are great for accurately measuring the setting point of jams, but there are other ways of testing this out lined on the jam making tips page. This is needed if you intent to make fruit jelly. Traditionally a muslin bag was used but an ordinary gauze from a chemist will work fine. These can be purchased or made out of grease proof paper if you need them. I use them as a fairly airtight and clean seal between the jar and the lids. 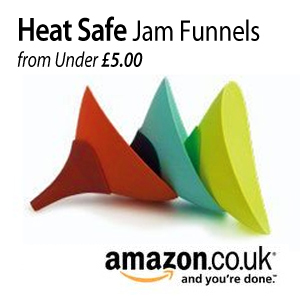 They can also be used in conjunction with waxed paper discs and an elastic band to keep the jam fresh instead of lids. However once you start using the jam they can be fiddly to replace them each time. Always label the jam with type and date produced. You can buy them or make your own. I would advice putting something like clear plastic sticky tape over them on you jars as sticky jam and temperature changes may cause them to fall off leaving you with a shelf of unlabelled and sometimes mystery jam.